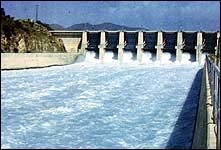 What are Reservoirs and Dams Used For? For centuries, the world's water resources have been developed to benefit mankind. The construction of dams to create reservoirs has served many purposes. They are also used to regulate the flow of water in rivers. Water can be released from the reservoir during drier seasons to support wildlife and the environment downstream, and to provide a resource for human uses. Reservoir water can be used to supply water to our homes and factories. Reservoirs are designed to store the rain that falls during the wetter parts of the year, so that there is a continuous supply of water for the drier periods. The water from reservoirs must be cleaned before it is used. This is done at a water treatment works. Chemicals are added to help remove unwanted naturally occurring mineral particles and harmful bacteria. Dirt and other small particles are usually removed by filtering the water through beds of sand and gravel, or by adding chemicals that cause the particles to stick together so that they can be separated off from the water. Once the water is treated, it is transferred to a service (or storage) reservoir ready for distribution. Service reservoirs are covered reservoirs. In the UK, there is a network of tens of thousands of kilometres of underground pipes that carry billions of litres of clean water every day to homes, offices, schools, factories and hospitals. Find out more about water treatment and its distribution. Reservoirs can be used to store water to feed hydroelectric power stations. Hydroelectric power is generated by using the energy from falling water to drive water turbines that in turn drive electric generators. The reservoir water is stored at a higher level than the turbines, which are housed in a power station. 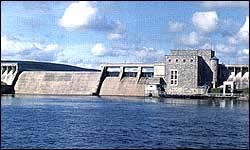 Sometimes, the power station is directly in front of a dam, and pipes through the dam feed water directly to the turbines. In other cases, the power station is some distance downhill from the reservoir, and the water is fed to it through long pipes or tunnels called penstocks. Find out about visiting the Dinorwig and Ffestiniog Power Stations in North Wales. Water from snow and rainfall will find its way into stream and rivers and eventually into the sea. After severe storms, or heavy snow or rain over a number of days, the water level in rivers can rise dramatically. 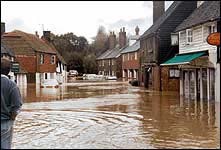 Sometimes, the water flows over riverbanks or walls causing flooding of farmland, property, and in the worst cases, loss of life. 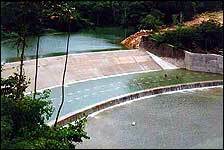 A reservoir can be used to control the amount of water flowing in a river after heavy rain. The water level in the reservoir is kept low during the rainier periods of the year. When heavy rain occurs, it is stopped by the dam and held back in the reservoir. When the reservoir gets too full, the floodwater can be passed downstream over a spillway. Sometimes, floodgates are used on top of spillways, and they can be fully or partly opened to control the amount of water let out into the river downstream. Plants will grow naturally on fertile soil that is watered by rain. 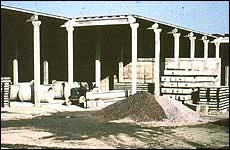 However, in regions of the world where the climate is very dry for some seasons, the soil becomes so dry that it restricts the growth of vegetation. This problem can be overcome by irrigation, a man-made system for watering the land. Irrigation water can be stored in reservoirs during the rainy season, then in the drier seasons it can be released from the reservoir and distributed over the land through a system of canals. Usually, the water flows under the influence of gravity to the areas requiring it, or the water can be pumped out of the canals onto the land. The construction of a dam across a river forms a reservoir that raises the water level upstream, stores the water, and slows down its rate of flow. This improves the navigation conditions upstream of the dam for ships and boats. Dangerous areas of rocks and sandbanks, previously in shallow water, become well covered, and rapids in the river disappear. Also, water from the reservoir can be released into the river downstream during the drier seasons of the year to make sure that it is deep enough for navigation all the year round. A dam forms a barrier to any shipping, so navigation locks (similar to the canal locks in Britain) can be constructed to one side of the dam, or special lifts can be built into the dam for raising and lowering vessels. A ship lift and a navigation lock are being provided in the Three Gorges Dam which is currently being constructed across the Yangtze River in China. 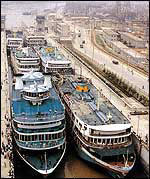 The ship lock will have two channels each 1.6 kilometres long. There will be five steps in each channel to raise and lower vessels over a maximum height of 113 metres.